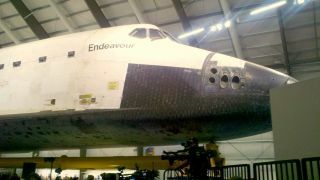 Endeavour is a tight fit inside its new home at the California Science Center, but the accommodations are temporary until a new facility can be completed. LOS ANGELES, Calif. — Amidst much fanfare, the new museum display featuring retired space shuttle Endeavour opened to the media and invited guests here on Wednesday (Oct. 30). Groups of children from museum-partnered elementary schools were in attendance alongside reporters and invited guests at the new Samuel Oschin Space Shuttle Endeavour Display Pavilion at Los Angeles' California Science Center. The opening ceremonies were befitting of the orbiter's return to Southern California, where it was built back in the 1980s. Crowds beneath the tiled underbelly of Endeavour during a pre-opening press tour. The orbiter is being temporarily housed in a metal hangar building connected to the main California Science Center museum. A new, much larger building will be completed nearby within a few years, and will feature the shuttle in vertical configuration, complete with solid rocket boosters and an external tank mock-up. This will make Endeavour the only retired shuttle to be displayed in "launch mode." Endeavour's sibling shuttle orbiters, Discovery and Atlantis, will spend their retirement at the Smithsonian National Air and Space Museum outside Washington, D.C., and the Kennedy Space Center Visitors Center in Florida, respectively, while the prototype shuttle Enterprise is on display at New York City's Intrepid Sea, Air and Space Museum. Endeavour's opening ceremony began Wednesday with Bill Nye, former TV host and current CEO of The Planetary Society, introducing featured speakers. After opening remarks, the Grammy Award-winning singer James Ingram delivered a stirring rendition of "I Believe I Can Fly." The assembled crowd joined in for the final refrains. Ingram later commented that he was very proud to be associated with this grand opening, and how glad he was to have such an icon of the space age in Los Angeles. "It gives me hope that one day regular folks like us can go into space and come back transformed," he said. A California Science Center guide discusses the Space Shuttle Main Engine display with invited guests. Among the featured speakers were California Governor Jerry Brown, who pointed out that Endeavour had been built just a few miles away at (then) Rockwell International, and had been a boon to the California economy. He challenged the "many naysayers who ask why did we spend billions on the shuttle and $2.5 billion on Curiosity?" "Why? Because human beings are about exploration, are about experimentation," he said. Los Angeles mayor Antonio Villaraigosa also took the podium to comment on what Endeavour means to Los Angeles and the future of science and technology education. When the mayor addressed the children present, asking who wanted to be an astronaut, most of the adults in the room joined the kids to raise their hands with great enthusiasm. Nichelle Nichols of "Star Trek" television fame was also present, as was June Lockhart from "Lost in Space." Both were warmly welcomed by the crowd, with Nichols acknowledging her introduction with a famous Vulcan gesture and a hearty "Live long and prosper." Antonio Rosales, a fourth grader at the Science Center's resident magnet elementary school, could barely take his eyes off the orbiter. "It's so big!" he exclaimed. "I like science, and my school is really cool because we get to do science. And now we have this," he gestured to the orbiter, "And that's really, really cool." Sophie Juarez, a second grade student, proudly announced that she knew the number of flights that Endeavour had made. "Twenty-five!" she beamed. "It went to space 25 times." She then looked shyly at her friends surrounding her, and whispered, "I want to be an astronaut when I grow up and go to the moon!" David Dickenson of Los Angeles stood nearby with his young son. "I wanted him to see the shuttle and remember this moment," he said. The boy, Matthew, pulled his father toward the nearby shuttle main engine display. "He's only five, so it may be a bit soon. But I think he'll remember it. I sure will," Disckenson said. The main engine exhibit, video kiosks and a Spacelab unit round out the exhibits inside the hangar. A group of children from the Dr. Theodore T. Alexander Science Center School get their first look at Endeavour. A few hundred feet away inside the adjoining museum, well over a thousand people stood in line awaiting the public opening at 11 a.m. PDT. Clarisse Washington was typical of the crowd: "I just had to come," she said. "The shuttle is such a part of us, of L.A., you know? I just can't wait to get inside!" Behind her stood Ralph and Linda Johnson. "We came from the Bay Area to see this opening," Ralph remarked. "It's not everyday that a shuttle arrives in California, and now that we are retired, it's time to do the things that count." Outside a balmy sun warmed further crowds gathering around the building hoping for a chance to see the newly arrived orbiter. Hawkers sold American flags and "Endeavour Mission 26" buttons. It was a festive picture and the crowds were all smiles as they prepared to enter the exhibit. Bruce Wexler of Westminster, Calif., summed it up best. "Look at these people! It's just so thrilling to see all these people come out to see the shuttle," he said. "It's great to see the interest in space, and I think this exhibit will be good for getting kids interested in science again."